Brr, it’s definitely getting colder! If it’s cold enough to warrant wearing a scarf and some gloves, then I think it’s about time I ramped up my skincare wardrobe to make sure my face can cope with the chill. My skin gets dry at the best of times, so I have been making an effort to make sure everything is as nourished as possible. Two things I recommend for colder weather – a nice greasy cleanser to leave skin delicately nourished. I love the Oskia Renaissance Cleansing Gel because it melts makeup and never leaves the skin feeling stripped. I also think you should never underestimate the power of a good serum – I always notice a difference when I don’t use one. I can’t live without the Antipodes Hosanna Serum – an absolute must for dehydrated and thirsty skin. It’s light and packed full of delicious skin-loving ingredients. Two favourites from one of my favourite brands – the Clarins Extra-Comfort Toning Lotion is the best toner ever for soothing a dry and irritated complexion. This stuff is magic! 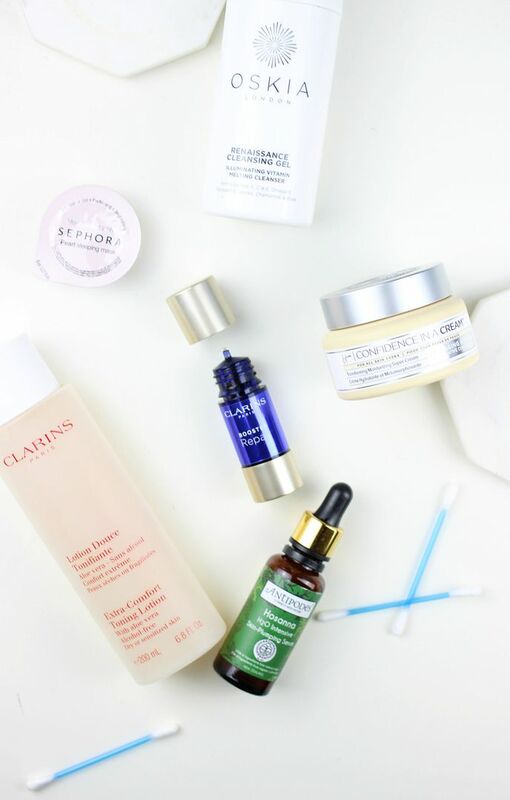 Also have a lot of love for the Clarins Repair Booster – I use it as a little potion to mix in with my moisturiser or my foundation as an when I need it. I always get facials at Clarins, and they always recommend this. Two things I picked up in New York – the Sephora sleeping mask (I like the pearl one), and the It Cosmetics Confidence In A Cream. It Cosmetics is a brand I’m really interested in at the moment, and this cream really is a little treat for a parched complexion. It’s gorgeously rich and buttery in texture, and acts a nice cushion to prevent any dryness! I am loving it as a base under makeup as well.Early days, but I am nicely impressed so far.